There comes a time when an individual is unable to reach a certain height. Creating a small set of steps allows an individual to reach a height that would otherwise be unreachable to him. With plywood and a few 2-by-10s, you can build a small set of steps that you can continue to use for various tasks for several years to come. Create steps from wood in a short amount of time. Place one 33-by-18 inch piece of plywood on a flat surface. Place the plywood horizontally so the 33-inch edges run along the top and bottom sides. Measure up 6 inches along the left side of the plywood from the bottom corner and mark the location with a pencil. Line the T-square along the left side at the 6-inch mark and draw a 10-inch line toward the right side of the plywood. Line the T-square vertically at the end of the 10-inch line and draw a 6-inch line upward toward the top edge. Line the T-square to the end of the 6-inch line horizontally and draw a 10-inch line vertically with a pencil. Repeat steps three and four one additional time to create an outline for three steps with the final 10-inch line running across the top edge of the plywood. Repeat steps one through five with the remaining 33-by-18 inch section of plywood. Once drawn, cut along these lines with a hand saw. 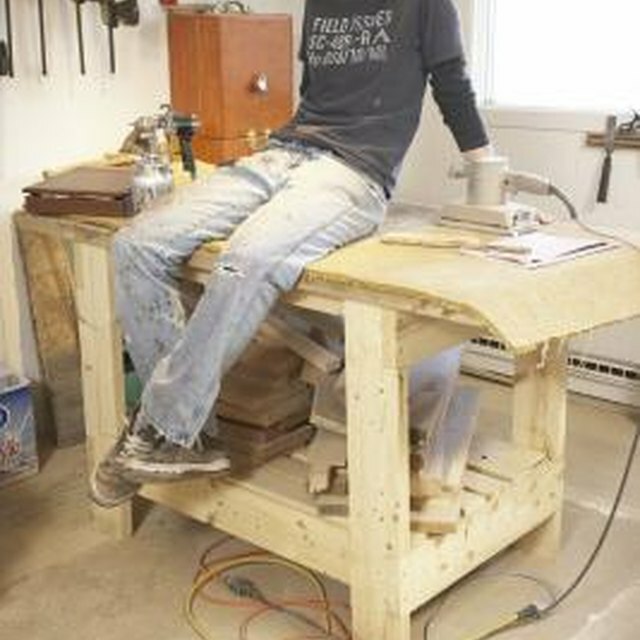 Hold the two sections of the plywood in a standing position with the steps moving upward from left to right. Place one 27 ½ inch 2-by-10 at the from and back corners of the step along the ground and drive two 3 inch screws through each end of the 2-by-10s to join them to the plywood. Place the final 27 ½ inch 2-by-10 in a standing position between the top corners of the steps, lining up the back edge of the steps with the edge of the 2-by-10. Drive two screws through each end to join it with the plywood. Set one 30 inch 2-by-10 in each of the three 10-inch tread holders on the plywood, lining up the outer edges of the plywood with the ends of the 2-by-10s. Drive three evenly spaced screws down through each end of the three 2-by-10s to join them to the plywood permanently.